Motivated only to keep our amiibos out of the hands our crazed<sup>†</sup> 2 year old, I purchased some NFC cards to copy our amiibos to. Then if he chews the card, we won't be as heart-broken, right? So, I purchased a set of NFC cards, credit card sized, and started looking at printing on them. We have a black & white laser printer that I purchased a few years back for around $70 on clearance. We're still on the starter cartridge. I'm also cheap, so instead of getting a proper setup, I tried a variety of ways to get the cards printed on without purchasing anything extra, using everything from acetone to glue. After finding a color laser printer, also for $70 on clearance, we got serious about it, purchased some supplies, wax paper, parchment paper, sticker paper, decal paper, jammed some pages, and ruined some furniture. But in the end, we had Breath of the Wild amiibo cards. The current Zelda set below. 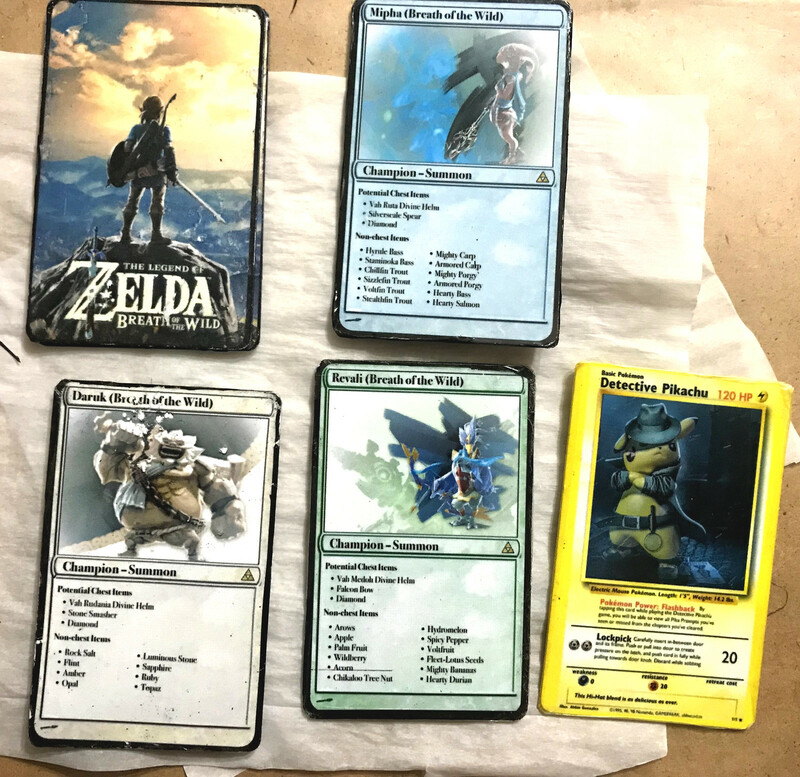 Some of these are from a reddit post I can't find now, that had printable MtG Zelda cards. I made them taller, and erased the content and replaced with BotW drops. The Wolf Link is different. The Wolf Link is a 20 heart Wolf Link (it's not cheating if it's just a variable :) ), so I wanted to make it special: full card background, Wolf Link overlapping the title, etc. It needed something else though, so glossy Mod Podge was added to Wolf Link, and extra was added to Link. The final process is probably going to be the official one everyone does: Photo Medium, then matte or glossy Mod Podge to cover. I might still use the decals though. If done correctly, it looks much better than a paper transfer. <sup>†</sup>Crazed. Synonyms: Demonic, Two year old, Toddler. <sup>†</sup>He's not demonic, just two. He likes to eat amiibos, starship models and homework. Only some kind of eff'd up, evil parents would call their kids demonic. Motivated only to keep our amiibos out of the hands our crazed<sup>†</sup> 2 year old, I purchased some NFC cards to copy our amiibos to. Then if he chews the card, we won't be as heart-broken, right? I can't remember how, but somewhere along the line, I saw Breath of the Wild cards styled like Magic the Gathering. I had to have that as an NFC. _HAD TO HAVE_ So, I purchased a set of NFC cards, credit card sized, and started looking at printing on them. We have a black & white laser printer that I purchased a few years back for around $70 on clearance. We're still on the starter cartridge. I'm also cheap, so instead of getting a proper setup, I tried a variety of ways to get the cards printed on without purchasing anything extra, using everything from acetone to glue. After finding a color laser printer, also for $70 on clearance, we got serious about it, purchased some supplies, wax paper, parchment paper, sticker paper, decal paper, jammed some pages, and ruined some furniture. But in the end, we had Breath of the Wild amiibo cards. MtG BotW cards, with a Pokemon style Detective Pickachu ! [https://flic.kr/p/25wsg2j](https://farm1.staticflickr.com/948/41038737944_f1f81cc845_h.jpg) The current Zelda set below. 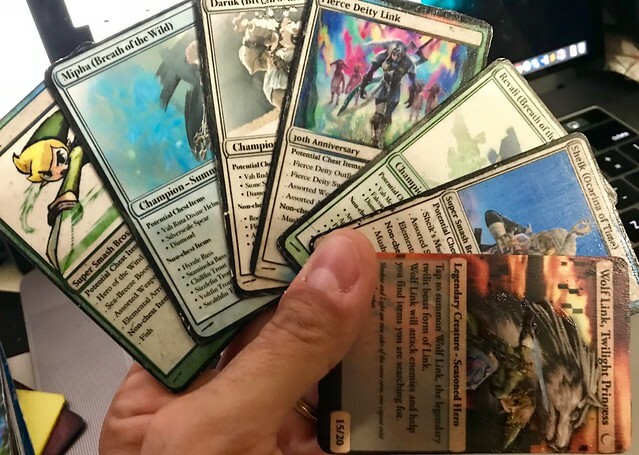 Some of these are from a reddit post I can't find now, that had printable MtG Zelda cards. I made them taller, and erased the content and replaced with BotW drops. The Wolf Link is different. ! [https://flic.kr/p/HCWriF](https://farm1.staticflickr.com/969/27328642517_b6fdd39576_z.jpg) The Wolf Link is a 20 heart Wolf Link (it's not cheating if it's just a variable :) ), so I wanted to make it special: full card background, Wolf Link overlapping the title, etc. It needed something else though, so glossy Mod Podge was added to Wolf Link, and extra was added to Link. ! [https://flic.kr/p/26cnkyw](https://farm1.staticflickr.com/961/41479120994_32b9cd0913_z.jpg) The final process is probably going to be the official one everyone does: Photo Medium, then matte or glossy Mod Podge to cover. I might still use the decals though. If done correctly, it looks much better than a paper transfer. <sup>†</sup>Crazed. Synonyms: Demonic, Two year old, Toddler. <sup>†</sup>He's not demonic, just two. He likes to eat amiibos, starship models and homework. Only some kind of eff'd up, evil parents would call their kids demonic.